(CORPUS CHRISTI, Texas)—One couple has planted their roots deep in the Texas soil, growing crops and raising cattle in two Texas counties. Passion, drive and dedication have paid off for Justin and Lindsay Hannsz of Erath County. The couple was named the winners of Texas Farm Bureau’s 2018 Outstanding Young Farmer & Rancher competition at the organization’s 85th Annual Meeting in Corpus Christi today. In addition to their own operations, Justin manages a wildlife ranch near Stephenville. Lindsay handles the day-to-day of family life and keeps their books in order. Together, they’re raising a family and cultivating a life on the farm. It can be tough to manage it all, but their three children—sons J. and Brazos and daughter Hadley—are the reasons Justin and Lindsay keep going, even when the road gets tough. And a passion for agriculture is already taking root for the kids. The couple also serves on TFB’s Young Farmer & Rancher Advisory Committee, and they participate in Farm Bureau activities on the county and state level. As winners of the Outstanding YF&R contest, the Hannsez will represent Texas at the national competition in January. They’ll also receive the title to a 3/4 ton, 4-wheel drive Ford pickup with a diesel engine, courtesy of Texas Farm Bureau Insurance Companies, and a $5,000 cash award, courtesy of Farm Credit. Other finalists in this year’s competition include Ryan and Santanna Bay of Gatesville and Braden and Jordan McInnis of Tennessee Colony. The two runners-up will receive a $500 cash award, courtesy of Southern Farm Bureau Life Insurance Company. The winner of the national award will receive a $35,000 credit toward a Ford Truck, courtesy of Ford Motor Company. Information on other young farmer and rancher events and activities can found online at www.texasfarmbureau.org/YFR. 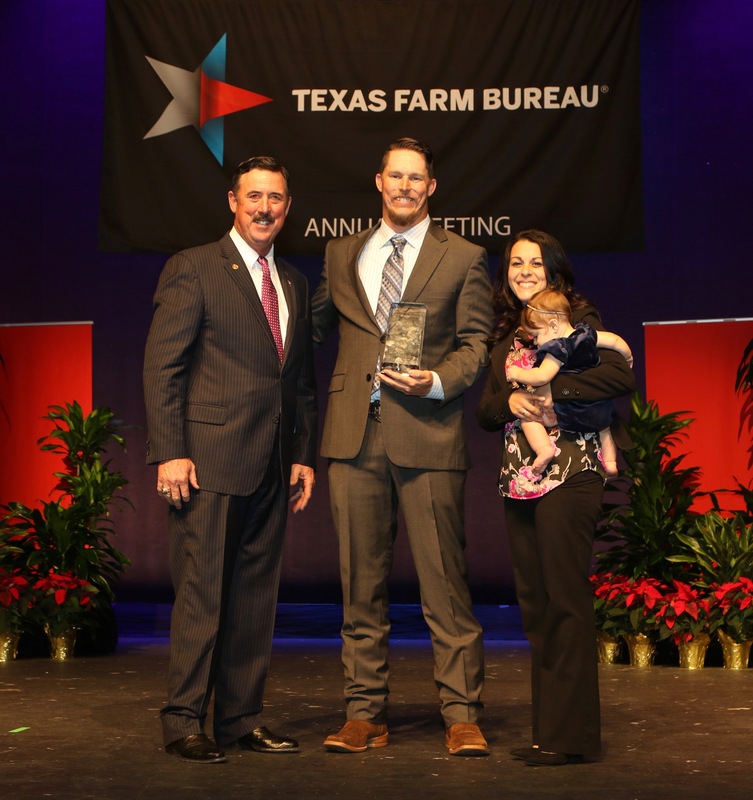 Justin and Lindsay Hannsz of Stephenville are named the winners of the 2018 Texas Farm Bureau Outstanding Young Farmer & Rancher contest at the organization’s 85th annual meeting in Corpus Christi.